Whenever I read the comments on the social media, I marvel at the depth of wisdom, knowledge and understanding of life’s issues that reside in Nigerians. The book garlanded in flowery words by the eminent professor is a new book by Chukwuneta Oby, a newspaper columnist who sees herself as “a non-graduating student of life and one to whom writing is an accidental passion.” On Facebook, she has a forum called “Facebook Parliament” where friends send in their original proverbs, wisecracks, life lessons, plus letters pouring out their souls and seeking advice and comments from members of the parliament who all offer their counsel. Finding herself deluged with an avalanche of such witty words, she decided to compile them into a book. A copy landed on my table last week. 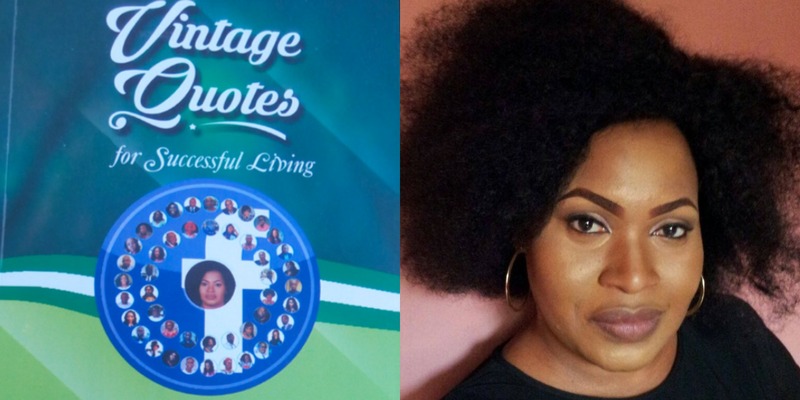 The book titled Vintage Quotes for Success Living from Chukwuneta Oby’s Facebook Parliament would be presented to the public on November 24, at Muson Centre, Lagos. I ask the author what inspired the book and she replies: “It was the desire not to let words that I consider worthwhile, go to waste. Whenever I read the comments of friends to my posts on the social media, I marvel at the depth of wisdom, knowledge and understanding of life’s issues that reside in Nigerians. It would have been most regrettable to just read such punchy lines and just click ‘like’. And go. Those words deserve to be given some timelessness. “People contact me on their (mostly relationship) issues, which I edit and post (with their permission, of course)…for wider views from my social media acquaintances. Oby does not have all the answers…I always say. It’s in the course of reading the submission of friends on the various issues that we talk on that one often comes across brilliant views. It would be most unfair to humanity not to immortalize such views. They are the kind of words you inscribe (as TIMELESS) on the marble of life. “Quotes are bursts of enlightenment in living. They are an eye opener to the bigger picture. Alley to ideas. Some quotes are also inducers of laughter in living. “A good quote should be unambiguous, have practicality and some relativity to whatever situation it is seeking to address. “Where a lie came from, other hidden lies are still packed in there.”— Cynthia Valerian Raphaels.